In today’s Gospel, Jesus confounds the Pharisees, His enemies, who more than ever are compassing His ruin. His reply is full of divine wisdom. The Apostle Paul in his Epistle to the Philippians illustrates how destruction is the end of those who are enemies of the Cross, and those who laughed and derided our Lord have discovered this only too well. It is left to the Church to counsel all that Christ means what He says and, refreshingly in light of Vatican II-speak ambiguity, says what He means. The Time after Pentecost is the symbol of the Church’s long pilgrimage towards heaven, the last stages of which are described in prophetic language on these closing Sunday’s of the season. Quite naturally, the breviary lessons during November are taken from the major and minor prophets who foretell the events which will mark the end of the world. After the Jews had been carried captive into Babylon, Jeremias wandered among the ruins of Jerusalem, uttering his lamentations. “Regard, O Lord, how doth the city sit solitary that was full of people! How is the mistress of the Gentiles become as a widow… Weeping she hath wept in the night and her tears are on her cheeks” (2nd response for the first Sunday in November). But he goes on to foretell the twofold coming of the Messias who will restore all things. “The Lord hath redeemed His people and delivered them; and they shall come and give praise in Mount Sion, and they shall flow together to the good tidings of the Lord” (Jeremias xxxi, 11, 12). Among those who had been carried captive into Babylon was a priest named Ezechiel who had foretold the captivity which was to overtake Israel. “The end is come, the end is come,… Now I will pour my wrath out upon the… and I will judge the according to thy ways… neither will I show mercy” (Ezechiel vi, 6-8). Later, when in exile, he prophesied further. “Our iniquities and our sins are upon us… how can we live? Say to them: As I live, saith the Lord God, I desire not the death of the wicked, but that the wicked turn from his way and live. Turn ye, turn ye, from your evil ways: and why will you die, o house of Israel?” (Ezechiel xxiii, 10, 11). In one vision almighty God showed the prophet the future Temple established on a high mountain, pointing out to him how perfect would be the worship He would expect from His people when He had gathered them once more to the eternal hills of Sion. Again, Daniel, also one of the captives in Babylon, explained Nabuchodonosor’s dream in the sense that the little stone which became a great mountain after having overturned the statues of Gold, Silver, Iron and Clay is a symbol of Christ Whose kingdom shall supersede all kingdoms and last forever. Among the Minor Prophets Osee is the one of whom most use is made in the official worship of the Church (in the fourth Week in November). He foretold that God would bring to an end the kingdom of the House of Israel, and that it would be said to a people that was not His people: “Ye are the sons of the living God. And the children of Israel and the children of Juda shall be gathered together, and they shall appoint themselves one head.” “These words,” says St. Augustine, “are a prophecy concerning the Gentiles, who at first, did not belong to God. And since the people of the Gentiles is also spiritually of the number of Abraham’s servants, and by this title are called Israelites, the prophet adds: “The children of Israel and the children of Juda shall be gathered together and they shall appoint themselves one Head.” We think, naturally, of Christ as the corner-stone and of the two walls, one composed of the Jews and the other of the Gentiles, the first called Juda, and the second Israel; both resting on the same foundation and rising on the same ground. As for those Israelites according to the flesh who at present will not accept Christ, the same prophet foretells that one day they will believe in Him, that is not they themselves (since they will have gone to their own place) but their children. This Osee asserts in so many words when he says: “The children of Israel shall sit many days without king and without prince and without sacrifice and without altar and without therapim” (Osee iii, 4). Who does not see that this is the state of the Jews at the present time?” (Third nocturn, fourth Week). 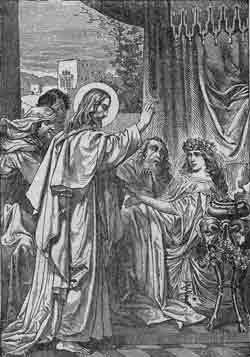 The woman troubled with the issue of blood twelve years is the people of the Gentiles, who fell sick while the Jews, represented by Jairus’ daughter, who was twelve years old, were being born to the faith. Now, while our Lord was on His way to the daughter of the ruler of the synagogue, this woman troubled with the issue of blood approached Him, so that while on His way to one person, He healed another. The apostles acted in the same way they told the Jews: “To you it behooved us first to speak the word of God: but because you reject it and judge yourselves worthy of eternal life, behold we turn to the Gentiles.” So long as the hands of the Jews, full of blood, remain uncleansed, their synagogue, now dead will not rise again” (Homily for this Sunday). In the same strain the Alleluia and the Offertory psalm relate how from the depths of exile the two nations have cried to the Lord imploring Him to hear their prayer, and how “with the Lord there is plenteous redemption, and He shall redeem Israel from all his iniquities” (v. 7). So let us pray with confidence, for if at Jairus’ prayer, our Lord raised his daughter from the dead, and if He healed the woman with the issue of blood in response to her faith, it will be by carrying out our Lord’s precept: “All things, whatsoever you ask when you pray believe that you shall receive: and they shall come unto you”; in other words, by turning to God in prayer full of faith, the Gentiles will be cured of their evil passions, and Israel will rise to her true life in Christ. This return of the daughter of sin to the Truth, after her period of temporary death, will be a sign that the Last Day is near at hand, for it will put the final seal on the fulfilment of prophecy. Then freed, at last, “from the bonds of sin which by frailty we have contracted” we shall glory in God and give thanks to Him forever (Collect and Gradual).